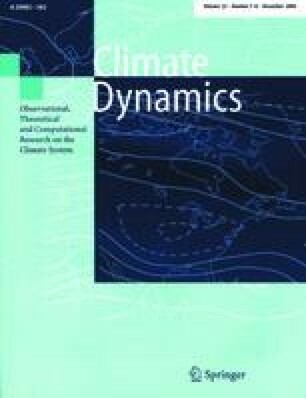 The effect of changes in zonal and meridional atmospheric moisture transports on Atlantic overturning is investigated. Zonal transports are considered in terms of net moisture export from the Atlantic sector. Meridional transports are related to the vigour of the global hydrological cycle. The equilibrium thermohaline circulation (THC) simulated with an efficient climate model is strongly dependent on two key parameters that control these transports: an anomaly in the specified Atlantic–Pacific moisture flux (ΔF a ) and atmospheric moisture diffusivity (K q ). In a large ensemble of spinup experiments, the values of ΔF a and K q are varied by small increments across wide ranges, to identify sharp transitions of equilibrium THC strength in a 2-parameter space (between Conveyor “On” and “Off” states). Final states from this ensemble of simulations are then used as the initial states for further such ensembles. Large differences in THC strength between ensembles, for identical combinations of ΔF a and K q , reveal the co-existence of two stable THC states (Conveyor “On” and “Off”)—i.e. a bistable regime. In further sensitivity experiments, the model is forced with small, temporary freshwater perturbations to the mid-latitude North Atlantic, to establish the minimum perturbation necessary for irreversible THC collapse in this bistable regime. A threshold is identified in terms of the forcing duration required. The model THC, in a “Conveyor On” state, irreversibly collapses to a “Conveyor Off” state under additional freshwater forcing of just 0.1 Sv applied for around 100 years. The irreversible collapse is primarily due to a positive feedback associated with suppressed convection and reduced surface heat loss in the sinking region. Increased atmosphere-to-ocean freshwater flux, under a collapsed Conveyor, plays a secondary role. This work is an output of the GENIE project of the UK Natural Environment Research Council (NERC) e-Science thematic programme (NER/T/S/2002/00217). M.Y. Gulamali, T.M. Lenton and A. Yool are funded by GENIE. R. Marsh is supported under the NERC Core Strategic Programme, “Ocean Variability and Climate”. N.R. Edwards is supported by the National Centres of Competence in Research (Climate), Switzerland. David Baker and Oz Parchment (University of Southampton) provided technical assistance by helping to achieve the first flocking of Condor pools through firewalls between UK universities. John Darlington (Imperial College) helped organise and facilitate GENIE experiments. The authors are especially grateful to Jochem Marotzke, for helpful guidance during early discussions of these experiments, and to Paul Valdes, whose original idea formed the basis of this work. We are also grateful to three anonymous referees whose suggestions considerably improved the final form of this manuscript. The computational infrastructure exploited in this paper represents a new paradigm in computing known as Grid computing (Foster et al. 2001). The resources exploited herein have been made available by their host institutions as part of the GENIE project, which aims to develop and deploy a Grid-based, modular, distributed and scalable earth system model for long-term and palaeo-climate studies to the environmental sciences community, as part of the UK’s e-Science programme (i.e. see http://www.rcuk.ac.uk/escience/). In this appendix we briefly describe this technology with respect to the analyses presented in this paper. The independent nature of each of the 961 individual model runs of C-GOLDSTEIN, in a single ensemble experiment, implies that there is no communication between runs and thus all runs can be executed simultaneously. We found Condor (Thain et al. 2003) to be an efficient and powerful computational resource that allowed us to perform our ensemble experiments in a fraction of the time of sequentially executed experiments. Condor is a specialized workload management system for computationally intensive jobs that can be configured to utilise spare CPU cycles on idle workstations. It can provide additional features for distributed computing jobs including automatic checkpointing, automatic job migration and automatic file transfer (e.g. see Litzkow et al. 1997). By making use of these features we were able to reduce the net execution time of a single ensemble experiment from the calculated 160 days (see Sect. 3) to approximately 3 days. Our Condor resource consisted of existing Condor “pools” residing at the London e-Science Centre (http://www.lesc.ic.ac.uk/), the Department of Computing at Imperial College London (http://www.doc.ic.ac.uk/), and the Southampton Regional e-Science Centre (http://www.e-science.soton.ac.uk/). These were combined into a single computing resource using the “flocking” features within Condor (e.g. see Epema et al. 1996). Port ranges, specified by the Condor and firewall administrators at the institutions above, were designated and utilised in order to overcome institutional firewalls. The flocked Condor pool was composed of approximately 200 Linux and Solaris based workstations at peak times (i.e. when the host institutions allowed these workstations to be available, and CPU activity on them was low). In order to run the C-GOLDSTEIN model on the flocked Condor pool it was compiled from source on both the Linux and Solaris platforms, with the standard Condor libraries. This allowed Condor to use additional features during runtime such as those described above. In particular, by utilising the Condor File Transfer Mechanism in our Condor submission scripts we did not have to ensure that each of our Condor pools in the flocked Condor pool had access to a shared file space. In addition to this computational resource, a prototype, web-based portal was also employed to manage the ensemble experiments. The portal automated the task of creating the necessary files for an ensemble experiment (amounting to the creation of 961 individual input files), as well as allowing one to submit experiments to the Condor pool and subsequently monitor their progress. The results of previously completed experiments could also be retrieved through the portal. The portal was accessed through a certificate-based authentication and authorisation mechanism, and used Apache Tomcat servlets technology (e.g. see Brittain and Darwin 2003) to interface the web server with the underlying Condor resource and file system, providing a systematic way of managing experiments. To summarise, the facilities described above raised the level of abstraction of the science presented herein, allowing us to rapidly develop and execute a succession of ensemble experiments, and affording us greater time to analyse and discuss the results of the experiments, without burdening us with the technicalities of the resources involved. Further details about the technological aspect of the experiments presented here may be found in Gulamali et al. (2003).